Prog rock dynamics with easily digestible pop song lengths might make American rock fans spring for a European import. Prog rock seems to go in and out of favor pretty quickly. Anyone remember The Mars Volta? Their first record was a prog renaissance, and their second disc split critics divisively. Was it a brilliant, long-winded masterpiece or just a lot of hot air and snobbish guitar playing with pretentious lyrics? Or was it both? 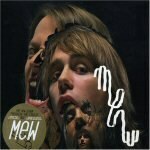 Prog rock fans not satisfied by current offerings in America will have to consult the Danish band Mew for their latest fix. We have all the hallmarks of a good prog record here: the rhythms are often reliant on non-traditional time signatures, songs fade in and out or run together instead of stopping and starting, and even the cover art seems ludicrously over-the-top in its inherent cheesiness. Also there's a "concept," as in Mew have made a concept album. I honestly don't know what the hell the concept is, though. Most of the lyrics are difficult to decipher. What I can glean is that we have songs about first loves and a chinaberry tree. We have semi-cleverly titled prog and metal clichés like "Apocalypso". We have a completely nonsensical album title that sounds cool while high or hoping to get high: And the Glass Handed Kites. The stars are aligned for a progressive masterpiece, and Mew certainly try to create one for us. Their noble attempt generates many excellent songs not easily confused with most of what currently appears on modern rock and heavy metal radio. The album begins deceptively with a heavy instrumental bloated with loud guitars, toms that sound like tympanis, and a booming snare. Don't be fooled by the beginning, though, as the song slowly melts into a choral melody of pop extravagance. It's deceptive because Mew is more pop-based than they let on. My only previous Mew experience is a song called "Saliva". That track is pure piano-driven pop that bounces along with about five separate but excellent vocal hooks. The good news about And the Glass Handed Kite's bloated masturbatory excess is that the pop sensibilities of "Saliva" remain. "Special" moves from a straight forward verse and simple downbeat bass notes to a shifting chorus with strummed triplets on guitar. By the second time through the cycle, it's changed. "An Envoy to the Open Fields" is constantly cutting off your attempts to play air drums the beat at home, so don't try. You'll injure something if you do. All the while, however, the melodies convert the complex instrumentation into manageable sideshows for the superior main event. It's this complexity that will either turn listeners off or intrigue them to devote a few listens to these songs. And if they do listen more than once, those brilliant pop melodies will hook them for life. In the hands of a less pop-minded band, these tunes would probably be mostly innocuous, but when Jonas Bjerre's angelic voice breaks from the intricate guitar lines, you're left with glorious pop music. And I mean glorious. Often complex and catchy, the melodies are frequently mimicked note for note by another instrument, be it guitar, piano, or xylophone. "Zookeeper's Boy" (just imagine the "concept" possibilities of that title) is the height of cheesy synths backing a melody that's either wordless or repeats the phrase "Are you my lady?" I can't tell. But I can tell that I remember its melody exactly. What often saves this record from the tedium that plagues many prog bands is the length of the songs. Only two songs are longer than five minutes, and they're the last two, so you don't even feel bad if you stop the CD early. Actually, I'd recommend it. That would cut the album down from its prog-like runtime and provide you with 14 more minutes to try to figure out exactly what the "concept" is.